Pepper Lunch: Enjoy 1-for-1 Beef or Chicken Pepper Rice on 19 September 2017 At All Branches! 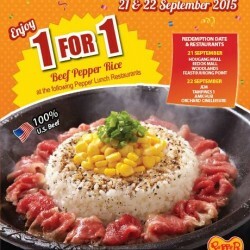 Enjoy 1-FOR-1 Beef or Chicken Pepper Rice on 19 September at all Pepper Lunch restaurants. Quick, gather your squad and present the below poster before ordering! 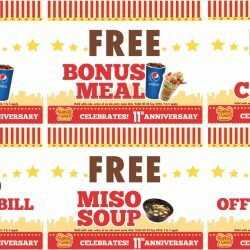 4 - 16 Sep 2017 Pepper Lunch: Enjoy Amazing Treats from $1.20 with E-Vouchers! 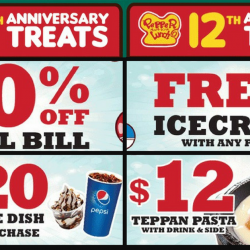 Celebrate Pepper Lunch's 12th Anniversary with e-vouchers with $1.20, $12 offers, free treats and more! Simply flash any of the screenshots below before ordering at any of the 7 Pepper Lunch Restaurants from 4 to 16 September 2017! 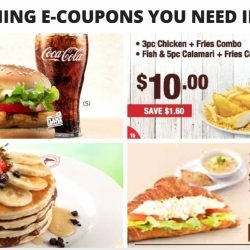 Till 2 May 2017 Pepper Lunch: Save up to $39.50 with these e-Coupons! Share these coupons with someone you care and let them save on their meals! Save up to $39.50 in total. 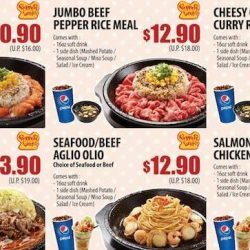 8 - 9 Mar 2017 Pepper Lunch: Like & Share for 1-for-1 Garlic Butter Seafood! 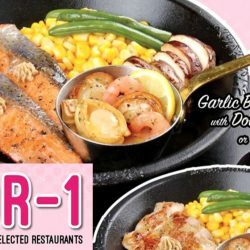 [Like & Share] This 8 & 9 March, Pepper Lunch is offering 1-for-1 to their Facebook and Instagram followers! Screenshot and flash this post to their cashiers to enjoy this deal. Enjoy abalone, scallops and prawns from just $8.40 onwards? You better believe it because the best things come in pairs! Gather your friends & enjoy this Garlic Butter Seafood fest together! 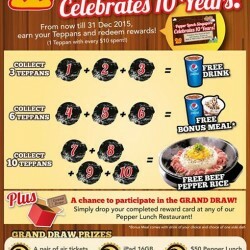 Join in the celebration of Pepper Lunch's 11th Anniversary Giveaway! Just screenshot the coupon to enjoy the IRRESISTIBLE deal up to 20% off total bill! T&Cs apply. To thank every fan for the support, we have these IRRESISTABLE & exciting Compass One Opening Special for you! 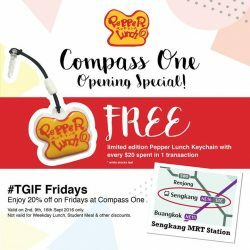 We are giving away FREE limited edition Pepper Lunch keychains* and a 20% OFF on TGIF Fridays^!! T&C below. So share this post, gather everyone, hurry over and have a sizzling good time with us! See you at Compass One #B1-01 from 1 September onwards! Simmer down after a hectic day with their warm and comforting Salmon Sukiyaki. For your full enjoyment, the sweet and salty soy sauce based broth is kept warm for a longer period of time on their patented teppan. Gather your friends, enjoy it at $14.80 (U.P $15.90) before promotion price ends tomorrow. Start your year right with Pepper Lunch's Fortune Seafood Pepper Rice! Packed with prawns, scallops and saba fish with a local favorite spicy dried shrimp paste, toss your way into the year of abundance at their Pepper Lunch Restaurant today! Good things are meant to be shared! 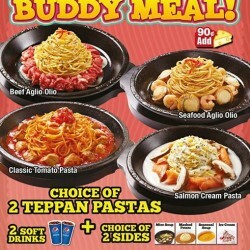 For just $24.90, you and your buddy get to enjoy your choice of 2 Teppan Pastas, 2 soft drinks and a choice of 2 sides! A fantastic change to try their Teppan pastas that are like no other! From now till 31 Dec 2015, be rewarded when you dine at Pepper Lunch Restaurants! 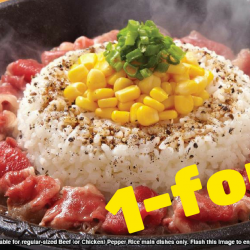 Earn 1 Teppan stamp with every $10 spent and you're on your way to redeem some free items from Pepper Lunch, as well as a chance to participate in their GRAND DRAW! 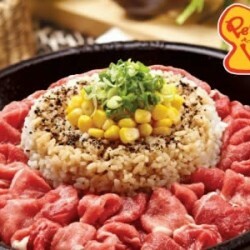 Drop by their Pepper Lunch Restaurants today! The Saba Mackerel contains a high amount of omega-3 fatty acids , which helps prevent cardiovascular disease and promote brain health? 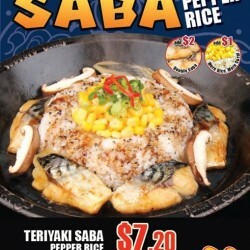 Starting today, catch their TERIYAKI SABA Pepper Rice promotion at their Pepper Lunch Express stores! 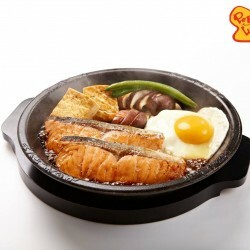 Grilled on their sizzling hot plate with classic Japanese Teriyaki sauce, it’s a yummy treat with some benefits! Swim over to any Pepper Lunch Express stores today to catch one at $7.20 or $7.50 for a TERIYAKI SABA Pepper Rice with Egg! Check out here for the nearest Pepper Lunch Express store. Enjoy and bring your family and friends for 1-for-1 Beef Pepper Rice. 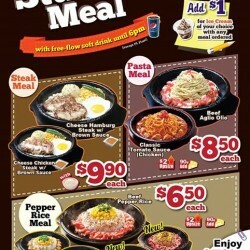 hurry down to our Pepper Lunch Restaurants. Valid On the 21st and 22nd Sept. Pepper Lunch would like to thank our loyal fans for the 10 great years of support. 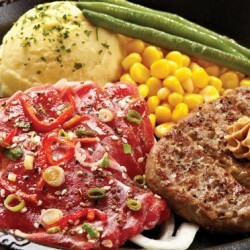 It's the last day to catch our GREAT STEAK SALE Promotion at our Pepper Lunch Express stores! Ribeye cut or Sirloin cut, you take your pick at affordable prices at our Express stores! Hurry down to catch these today. Great Steak Sale! 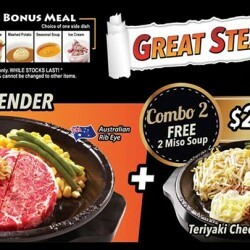 Enjoy their Prime Tender Ribeye steak & Teriyaki Cheesy Hamburg with FREE 2 Miso soups for only $29.90 (UP: $37.40) and just add $3 for bonus meal! Head down to a Pepper Lunch Restaurant now! Enjoy THE GIANT & Teriyaki Chicken with Egg with FREE 2 Miso soups for only $29.90! @ Pepper Lunch. They hope you had a good Labor Day weekend. 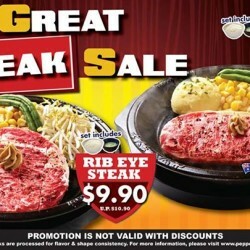 If you haven't noticed already, here's a GREAT STEAK SALE for you to kick off the week! 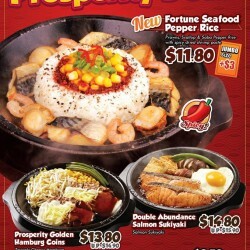 Hurry down to their Pepper Lunch Express (in food courts) stores to enjoy this deal today! While stocks last! Get your hands $6.50 for $10 Cash Voucher at Pepper Lunch at 6 Outlets until 31 May 2015. Introducing the BBQ BEEF PEPPER RICE! Paired with tangy onions and chili and topped with spring onions and zesty BBQ sauce, it's their Beef Pepper Rice sizzling up for a grill! Join the party at any of their Pepper Lunch Express outlets islandwide from 2 March 2015 onward! Watch a movie at Cathay Cineplex Cineleisure Orchard and present your ticket stub at Pepper Lunch (Cathay Cineleisure Orchard, level 5) to get $3 off! 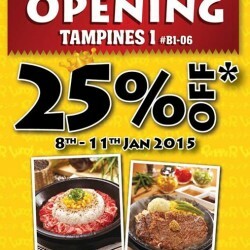 Starting the new year with the Grand Opening of Pepper Lunch Restaurant at Tampines 1 today (8 January)! From 8th - 11th January 2015, enjoy 25% off all ala carte Teppan main dishes! 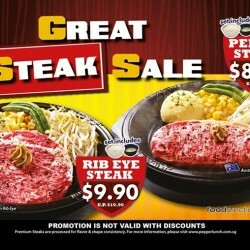 Hearty premium steak, sizzling curry rice options and more! Hurry down to celebrate with them! Movie Goers rejoice! Pepper Lunch @ Cineleisure Orchard Level 5 now offers $3* off ala carte dishes when you present your Cathay Cineleisure Orchard Movie Ticket stubs! Prepare your Student IDs! Student Meals at Orchard Cineleisure now runs all day and comes with bonus Free-Flow soft drinks* until 6pm! 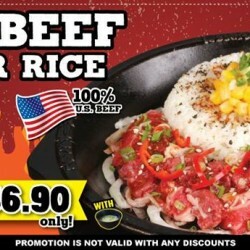 Indulge in sizzling plates of culinary goodness with this deal: Pepper Lunch Cash Voucher for Food and Drinks from $6.50 – that’s 35% OFF the usual price! Get this deal before it ends soon. Not Spicy enough? 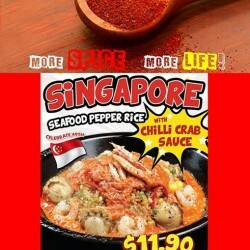 Ask for additional Chilli Powder for a Zestier Spicier edition of seafood pepper rice at Pepper Lunch!